I’m planning a day trip next summer to Ventura, California. Mapquest says it will take about three and a half hours one-way and is one hundred thirty-eight miles. The trip will be along CA 166 & CA 33-a route Jackie and I have taken numerous times in the Miata. Ventura is the quintessential California beach town and the place where Earl Stanley Gardner penned the Perry Mason series. If you’re under 55 the last tidbit of information won’t mean much, but should you want to find out more go to Youtube to watch episodes of the late ’50s and early 60s television series. This will be quite an adventure on the Enfield. Ventura is where I bought the bike in 2015, so it will be a homecoming of sorts. Pulled out of the garage about 10:30 and fueled up (4942 miles on the odometer) then headed down Bena Road. As always after a long break from riding, trepidation is a companion for the first half of the ride. This ride had a particularly new set of worries because I had done the work on the bike myself. Replacing the chain was an ordeal for a number of reasons; inexperience in basic motorcycle repair, buying additional hand tools and specialty tools, reordering the correct parts that matched the application, and a long time gap between tear down and installation. It was a good four months before the Enfield was back on the road. There was little choice however, since the only mechanic in the area willing to work on an Enfield had sold his shop and moved out of state. Fears put aside, my steel pony and I headed toward Caliente, and onto U.S. 58 East, exiting at the Keene exit. I hate riding on any kind of a freeway because of the speed requirements. For six miles the bike was flogged to hit sixty-five miles an hour at points. Most of the time I was able to do the optimal speed for the Enfield of 55 mph due to both light traffic and heavy truck traffic. It’s at the Keene exit that real motorcycle riding begins. The curves are tight and the scenery spectacular. Lots of oaks and golden foothills. Keene is one of the places we go (on the rare occasions that I ride with a group). A little cafe is the terminus for the ride–a place where we have breakfast, talk motorcycles and then head on home. To me, this is the starting point of the real ride. The header photo was taken at the “World Famous Tehachapi Loop.” This engineering marvel was designed to help trains get over the Tehachapi Mountains. Watching the trains ascend is much like watching a snake eat its own tail. Quite a view. Once past the loop, curves ranging from very tight S curves to hairpins punctuate the rest of the ride into Tehachapi. This is one of my favorite rides and I seldom see other motorcyclists on the road. California 202 isn’t a road favored by sports bike enthusiasts. Ride like a dipshit and you’ll find yourself either in a canyon or smashed into a boulder. The curves are too tight for that kind of action. 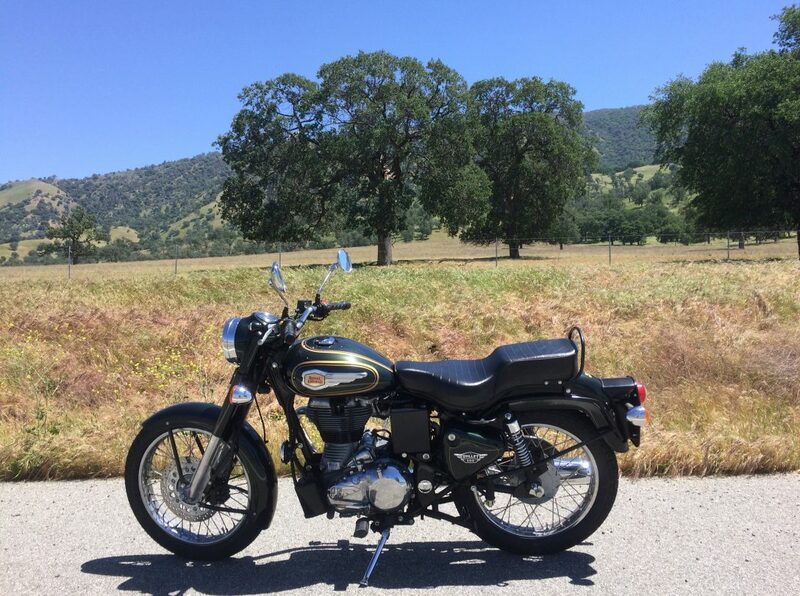 Once in Tehachapi, I did a bit of sight seeing on the main drag, parked at the Love’s truck stop for a restroom break and to let the bike cool a bit before heading back. Funny thing about the 202–the ride back is much less challenging than ride in. Maybe it’s the result of recently having navigated the curves, or it’s because your going down hill and don’t have to lay on the throttle so much. Instead of going the same way back I bounced off the 58 at Caliente and took a left onto Caliente Creek Road. Curves on this road are every bit as challenging as those on the 202. Months earlier, one of the guys from the group took a spill on his Triumph and broke his shoulder. It’s a narrow road that requires a rider’s undivided attention. From the there I picked up Bena Road down to Comanche and on home. Total distance of the ride was 92 miles and almost three hours long. Raj (my name for the bike because it’s manufactured in India) performed well. I know how ridiculous it is to ascribe animal like qualities to a machine, but felt almost as if the bike was glad to be out of the garage and back on the road. And so was I. At an age when most of my contemporaries are trading in their Harleys for golf carts I wanted one more wild fling. Maybe mild fling is more to the point. No one mistakes an Enfield rider as someone born to be wild. And yet, riding the updated fossil provides something in the neighborhood of excitement. This blog provides an outlet for my enthusiasm. Many an hour has been spent boring family and friends alike with talk about my Bullet. Many of you thought I didn’t see your eyes glaze over as I talked about replacing the prematurely worn out chain with a BMR 530 high tensile strength o-ring chain. Don’t get me started on the improved handling bestowed by Dunlop Gold Seal K70 tires. It doesn’t take long for feverish daydreams of a cross-country road trip to spill out and the room to quickly clear. Thus my rationale for this blog. A place for a goofy crank to rediscover dreams first imagined at fourteen during a time when American youth was on the move. Steve Belcher and I, both refugees from Algebra 1, sat in the back of a life skills math class talking about the merits of the Honda 450 while Mr. Bondi prattled on about the power of compound interest. Damn, I wish I had listened to that guy. Maybe my life savings would be more than a half-full change jar squirreled away under a rock in the backyard. Not quite, true. Anyway, this space is reserved for remembrances of fuel injected doses of joie de vivre brought on by a winding country road.